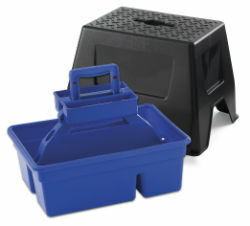 Step stool and tote box in one patented design! The sturdy tote holds supplies while the removable step stool fits over it to protect contents from the elements. Big enough to hold 12" spray bottles yet easy to carry with one hand. Internal storage tray holds small items. The tote box has a retractable handle that protrudes through the step stool for carrying, and retracts flush with the top of the stool so you can sit or stand on it. When not retracted, the handle can be locked with a padlock (not included). The stool features a non-skid surface and holds up to 300 lbs. Ideal for horse grooming, painting, cleaning, gardening, many other uses. Measures 20 inch long by 16.125 inch wide by 14 inch high. made of heavy-duty, impact-resistant plastic.